This week's photo prompt was taken by Arif Ikhwani, an Indonesian photographer. He took these in in Sidoarjo, Indonesia. 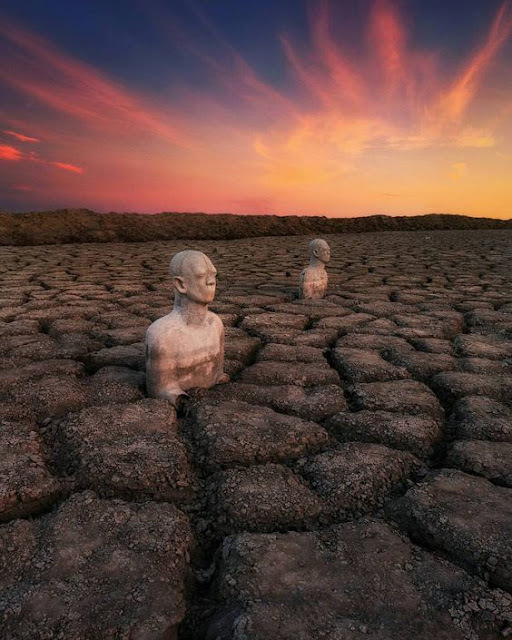 These are sculptures by an Indonesian artist Dadang Christanto, which were erected on the site to represent victims affected and have been slowly submerged by mud oozing from a mud volcano that is still erupting. This is the kind of tale that could turn into something much much bigger. And maybe it will, one day. I left it hanging to suit the word count. They appeared a few months after one of the severe storms. Emily had discovered them on her way to school – well school, it was what was left of a once thriving community, a collection of people trying to hold onto some kind of routine, some kind of connection in a world that was rapidly changing in a drastic and violent manner. The storms were new but the forecasts for them weren’t. There’d been warnings about their impending arrival for decades, but no one had believed they would happen. Everyone had thought it was just hype, something to sell clicks on news websites and that the root causes would be resolved. They hadn’t been. World governments had claimed to start changing environmental policies, but it had been too little, too late. The upside of the storms was they had brought down those news websites and those governments. In fact they had destroyed the entire network and brought such destruction mankind was struggling to hold on. Emily didn’t mind though. Without the network there was less distraction and less haste. She preferred that. There was more time to do things, like observe the world around you. And when she had come across the stone figures in the dried mud she’d done just that – observed them. She wondered if they were real people and the mud had just dried onto them making them look like stone, but she wasn’t going to venture out across the mudflat to find out. It had ruptured up from the earth below, bubbled up as a result of activity far below, so it wasn’t stable despite appearances. A couple of boys at school had tried, fortunately they’d been rescued. But these figures didn’t look like people caught in the destruction; there were no expressions of anguish or bodies contorted in defensive shapes, just straight, identical sentinels. It was unnerving. And when Emily told her teacher about them, she heard they weren’t the only ones; others had appeared in the towns nearby too. Her teacher had tried to hide her concern, but Emily had sensed it, and discussed it with her friends at break time. ‘You say that about everything, Gerrad. I don’t think they can be,’ Emily replied. ‘Because they’ve come from underground, that’s why, dufus!’ Spencer cuffed the back of Gerrad’s head. ‘You can still watch them on DVD,’ Gerrad suggested. ‘I think they’re some kind of portent,’ said Emily. ‘What’s a portent?’ Natasha asked. ‘Or is still happening?’ added Gerrad. ‘Give us hope, you mean?’ Spencer asked. They fell silent. None of them wanted to consider that. Hope was a big word to bandy about these days. ‘Anyway, I’m going to take another look on my way home from school. Who’s coming?’ Emily looked round at the group. They all nodded. That afternoon, having been let out early due to another storm warning, they walked home together. The wind was already picking up though, so they didn’t hang around and only stopped once they arrived at the open expanse of the mudflat. Emily gasped. ‘What’s wrong?’ Gerrad looked ready to run. ‘What do you mean “grown”?’ Spencer asked. Silence fell as they heard a cracking sound and the feet of two statues cleared the mud. The children froze until further movement broke their paralysis and they ran for home. The statues had turned as though watching them go. Yay the link worked. And this piece of microfiction is perfect. Thanks for joining. Great twist at the end. Thanks for joining. Well. The story is awful. 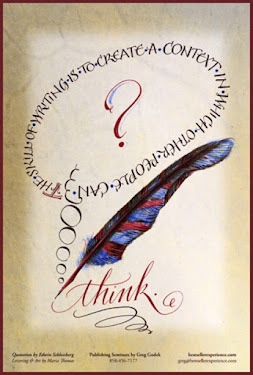 But, it's the first attempt at expressing the concept that's been in my brain cells for several years. I have no idea where this will lead. If it will lead anywhere. It's just an idea, at this point. I love the concept and to see where you will go with it. Thanks for joining in.